Spinner Nicky Boje and seamer Shaun Pollock took four England wickets each as South Africa completed a crushing 196-run victory to level the series on the final afternoon of the third Test here today. Captain Habibul Bashar fell just short of his fourth Test century when he was dismissed for 94 shortly before stumps as his side made a solid 280 for four on the opening day of the first Test against Zimbabwe today. Sri Lankan offspinner Muttiah Muralitharan is taking a lead role in providing relief to thousands of his countrymen affected in last week's tsunami, his manager said today. Arjuna awardee Col Balbir Singh (retd) is trying to collect and send as much funds as he can for the relief and rehabilitation of tsunami victims. Hailing from Sansarpur village, he has donated Rs 11,000 from his pension. Pakistan have recalled all rounders Azhar Mahmood and Mohammad Hafeez for the triangular one-day series in Australia. Announcing four changes for the one-day series that also features West Indies, chief selector Wasim Bari said Mahmood, Hafeez would be joined by opener Taufeeq Umar and paceman Rao Iftikhar. Accepting the challenge of Little Master Sachin Tendulkar, who is supporting the “Maratha Warriors” in Premier Hockey League scheduled to be held at Hyderabad from January 13, ace off-spinner, Harbhajan Singh today extended his support to the team of “Sher-e-Jalandhar”. The top seeded combine of Mahesh Bhupathi and Jonas Bjorkman survived a scare from unseeded duo of Michal Tabara and Santiago Ventura to storm into the doubles semifinal of the Chennai Open here last night. The USA’s hopes of winning a third consecutive Hopman Cup were left hanging by a thread today after they suffered a surprising defeat at the hands of Slovakia. Daniela Hantuchova beat Meghann Shaughnessy 6-4, 6-2 and Dominik Hrbaty held off James Blake 7-6, 6-4 to give the Slovaks an unassailable 2-0 lead and revenge for their defeat by the Americans in last year’s final. Former Australian Open champion Andre Agassi says he is as hungry as ever to claim the tournament for the fifth time later this month. “The second the hunger goes it is impossible (to compete),” a fit-looking Agassi told the crowd at the Australian women’s hardcourt championship at the Gold Coast today. International Master Raja Ram Laxman from Chennai wrested the sole lead with five points from as many rounds in the third Parsvnath International Open Chess Tournament at the Bapu Samaj Sewa Kendra here today. Asian Games champion Shiv Kapur hit a three-under 69, going into the final with a tally of 10-under 206, to put himself in line for the title in the RCGC Open, an event of the Amby Valley PGAI Tour. Vijay Kumar retained his overnight second position that he shared with Mukesh Kumar. PAP Zone maintained their supremacy in weightlifting by securing the team championship title with 336 points, followed by Jalandhar Zone (76 points) and Ferozepore Zone (56 points) during the third day of 49th Punjab Police Inter-Zone Sports and Athletics Meet near here today. England, unbeaten for more than a year, but set an unlikely 501 to win in just over five sessions, were dismissed for 304. Left-arm spinner Boje took four for 71 from 34 overs while fast bowler Pollock picked up four for 65 from 31 overs as the home side dominated in all departments. England number 11 Steve Harmison showed up his team-mates by top-scoring with a run-a-ball 42 and putting on 51 for the last wicket with Matthew Hoggard. England’s batsmen, however, effectively lost the game in the first innings, when they were skittled for 163 on a blameless track. The series now stands at 1-1. England won 11 of 13 tests in 2004, drawing the other two. Their last defeat was against Sri Lanka in Colombo in December 2003. They had resumed on 151 for five and soon lost their last specialist batsman when South Africa took the new ball in the fourth over. Fast bowler Shaun Pollock drifted a delivery into the left-handed Graham Thorpe which left after pitching and was edged to wicketkeeper A.B. de Villiers. Thorpe made 26. Wicketkeeper Geraint Jones and Ashley Giles kept South Africa at bay for almost an hour-and-a-half with a stand of 62 but they were parted 15 balls before lunch when Boje had Giles caught by Jacques Kallis at first slip for 25 with a classic delivery. Two balls before lunch, Kallis dived to his left to take a brilliant one-handed catch in the same position to dismiss Jones for 38. Hoggard and Simon Jones survived until the ninth over after lunch, when Jones, on 19, edged Pollock to Kallis at second slip. Harmison then produced his unlikely cameo over 12 overs, recording a career-best score. Pollock sought to rough up Harmison, but he responded with a cut and pull for four as 18 came off the over, leaving Pollock grinning. 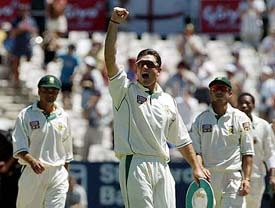 The match ended 20 overs after lunch when Harmison was caught by Boje in the gully off Makhaya Ntini. He hit seven fours and a six. The fourth test starts in Johannesburg next Thursday. Rajin Saleh was 60 not out while opener Nafis Iqbal added 56 as the hosts moved into a comfortable position in their quest for their first Test victory in their 35th match. Bashar, who had won the toss and elected to bat, scored at an impressive rate against the Zimbabwe attack, making his 94 off 128 balls before he was caught by Zimbabwe captain Tatenda Taibu to give debutant Christopher Mpofu his first Test wicket. Saleh, who was dropped by Graeme Cremer while on 41, equalled his test best score of 60 while combining in a 119-run fourth-wicket partnership with Bashar. Aftab Ahmed was six not out at the close. Earlier, Iqbal combined with Javed Omar in a 91-run opening partnership before Omar was caught behind by Taibu off Elton Chigumbura for 33. Iqbal followed two runs later when he caught by Vusi Sibanda off pace bowler Mluleki Nkala. Nkala, who was the pick of the Zimbabwe bowlers with two for 22 from 18 overs, grabbed his second wicket when Mohammad Ashraful (19) was caught by Hamilton Masakadza with the score on 153. Bashar and Saleh then combined before the Bangladeshi captain was dismissed with only three overs remaining in the day’s play. Fall of wickets: 1-91, 2-93, 3-153, 4-272. Muralitharan, who himself escaped the disaster only because he delayed his journey to the south by 20 minutes, has been busy distributing food relief around the country since the first day of the disaster, the bowler's manager Kushil Gunasekera said. Gunasekera said Muralitharan was on his way to a small village near the southern coastal city of Galle to participate in a ceremony to award scholarships to needy children, but turned back half way after being warned of the tsunami. "However, the saddest part is that 50 village children, most of them with their mothers, died in this tragic episode while on their way to receive the sponsorship of their essential school items for the year 2005," Gunasekera said. Muralitharan, the second leading Test wicket taker behind Australia's Shane Warne, signed up as an ambassador with World Food Programme last year. "The agency would have hoped for a couple of photo shoots and the odd public appearance. But they got a crusader, not an ambassador," reported the Cricinfo Web site from the bowlers trips to the coastal areas. 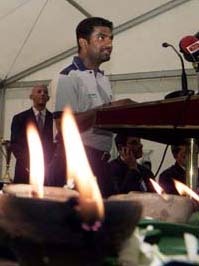 It also said Muralitharan was warmly welcomed by the inmates in camps for the homeless. In a novel gesture, India cricket team captain Sourav Ganguly has extended a helping hand to the West Bengal government to raise funds for tsunami victims through auction of cricket memorabilia of international stars. The collection from the auctions, to be held in Kolkata on January 30 or 31 and in Siliguri in early February, would be donated to the Chief Minister's Relief Fund, the State Urban Development Minister Asok Bhattacharya said here today. The bidding would see sports gadgets of cricket icons including Ganguly, Sachin Tendulkar, Muthaiah Muralitharan, Sanath Jayasuriya and Shane Warne going under the hammer, he said. Besides Ganguly, who has agreed to take initiative for the cause, a host of cricketers from both India and Sri Lanka including Tendulkar, were likely to be present on the occasion, the minister said. The 10th South Asian Games, scheduled to be hosted by Sri Lanka in August, have been postponed by a year in the wake of the tsunami disaster. Sri Lanka Minister for Youth Affairs and Sports Jeewan Kumaratunga said the games, previously called South Asian Federation Games, were being postponed as the time was not ripe to host such an event. He has motivated several others, including his close relatives, to donate as much as they can for the Prime Minister’s Relief Fund. His mother-in-law, Ms Surjit Kaur, has contributed Rs 10,000. Now a golf player, Col Balbir Singh has inspired his companions at the golf ground to donate. Col S.S. Cheema has donated Rs 10,000. Col Gurdial Singh has come up with a like amount. Wives of Army officers also collected some funds and donated Rs 5,000. Col Balbir Singh was a member of the hockey team that participated in the Asian Games in Bangkok in 1966 and won the gold medal. In 1968, he represented India in the 1968 Mexico Olympics. ''Five players -- Asim Kamal, Mohammad Sami, Danish Kaneria, Imran Farhat and Mohammad Asif -- will return home after the Test series,'' he told Reuters. Pakistan, who are struggling to avoid a 3-0 whitewash in the third Test in Sydney, play their first match of the one-day series on January 12 against Australia. The 29-year-old Mahmood last played for Pakistan in a one-day international against New Zealand in January 2003 while Hafeez's last appearance was in the home series against South Africa last October. ''We have made the changes on the recommendations of the tour management committee in Australia. According to them captain Inzamam-ul-Haq and Abdul Razzaq will be fit for the one-dayers,'' Bari said. Inzamam has missed the last two tests with a back problem and Razzaq was ruled out of the Sydney game because of illness. Bari said Sami was returning home because doctors had said he would take time to recover from a bruised heel. He added the selectors had been keen to retain leg spinner Danish Kaneria as he had been Pakistan's best bowler in the Test series. “Even I and Sachin have indulged in bet over the PHL as Sachin expects Maratha Warriors win in the tournament and I apprehend Sher-e-Jalandhar’s clinching the title” Harbhajan told reporters here today. Asked what exactly was at stake in the bet, Bhajji, who was in town to express his solidarity and support for Sher-e-Jalandhar, in a lighter vein said “I will take Sachin’s luxury car Farari, if I win the bet”. 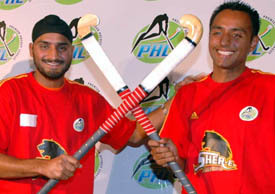 “Sher-e-Jalandhar will be my favourites for the tournament. The team led by Gagan represents the youth and passion of Punjab. The team epitomises the strength of the human spirit, lion heartedness and fearlessness as the people of Punjab are and I am sure they will exude their passion and aggression in the field, the way I love to” offie said wishing the team the very best for upcoming league. Gaganajit Singh, who was accompanying Bhajji and was looking confidant for the tournament, said that it was best team selected for Sher-e-Punjab. “Although we will miss penalty corner specialist Jugraj, who was yet to be fit for playing international hockey after he met with a road accident, but still we will perform well by recoverting from our past mistakes” Sher-e-Jalandhar’s captain said. Punjabi girls now have a reason to smile. Finally, the Indian off-spinner Harbhajan Singh today categorically rejected the reports with regard to his proposed marriage with Bangalore based girl Priya Reddy and said that he would only tie nuptial knot with a Punjabi girl. “The report published in a section of press about me getting married with final year psychology student at Bishop Cotton is totally baseless and devoid of the facts. I am not going to marry her. Definitely, I know her very much even as she is just a good friend. But, it does not mean I will marry her,” Turbanator, maintained. “I came to know about the report when my close friends and family members rang me up to congratulate over my marriage plans. Although I know Priya very well and even went along with her for outings, but it does not mean that I am going to marry her,” he asserted. “Even my parent scolded me for my reported decision of marriage, which I never took and it was only after my assurance to them to abide by their decision about my marriage, they calmed down,”he added. Asked about his marriage plans, Bhajji said that he would take decision on the issue only after a couple of years. It will be an arranged marriage and bride, a Punjabi girl, would be selected only by my family members. Rallying from a set down, the experienced pair of Bhupathi and Bjorkman kept their cool at vital moments to take the next two sets and clinch the match at 3-6, 6-4, 6-4. Despite their top seed billing, Bhupathi and his partner were forced to play, perhaps being under pressure, second fiddle to Tabara of Czech Repulic and Ventura of Spain. Tabara, who booked his place in the single’s quarterfinals earlier in the day, showed more aggression as the duo took the first set. The decider saw Bhupathi concede a break in the third game, making a coule of backhand errors. But in an instant fightback, the Indo-Swede pair broke Ventura’s serve in the very next game, with Bhupathi playing the role of aggressor. With one win and one defeat from their respective Group B matches, the USA, Slovakia and the Netherlands could all still qualify for Saturday’s final. The group scenario was complicated by the withdrawal of Mark Philippoussis because of an adductor injury, costing the Australian team any chance of qualifying. World number 324 Paul Baccanello would replace Philippoussis, but Australia’s results in their final match against the USA would not count for them. Hantuchova, who had slipped from her career-high ranking of five to number 31, produced a confident performance to see off Shaughnessy. After trading breaks in the seventh and eighth games, Hantuchova clinched the vital break in the ninth game. 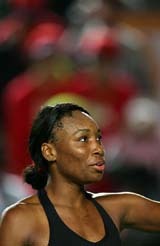 After taking the opening set, she ran away with the second to earn victory in 69 minutes. Hrbaty, who beat Philippoussis in his opening match on Monday, then fought off a tough challenge from Blake to give the Slovaks a surprise win. “I did not expect this. I already had my plane booked for Friday,” Hrbaty said. He was talking after a mini-exhibition with Australia’s former Davis Cup player Scott Draper during a break between matches. “I am 34 years old, going on 35 (on April 29) this year. Unless I am working harder and am as eager as ever, there is no chance,” he said. “But I am here with the intention of bringing my best and winning and that is what I am shooting for,” he said. Playing the queen pawn opening, Laxman grabbed the initiative early and applied constant pressure on Preetham to sew up the match in 63 moves. The top board game between overnight joint leaders Satyapragyan and Deep Sengupta ended in a quick draw at 21 moves. Top seed and Grandmaster Krishnan Sasikiran was made to sweat by Karnataka youngster M S Thej Kumar as the queens gambit accepted line gave very little advantage to Sasikiran. He had to bring out all his experience to subdue Thej Kumar in 41 moves. The win takes Sasikiran to the second spot at 4.5 points, along with Grandmasters Kunte, Filippov, Kayumo, Deep Sengupta and B S Sivanandan. Laxman next plays Kunte while Sasikiran takes on Sivanandan. Six more rounds remain in the 283-player Swiss event. Mukesh had a poor round to slip to the sixth position, having carded a five-over 77. In the leader group tomorrow, Shiv and Vijay will be joined by former Indian Open champion Feroz Ali, who shot an even par round of 72 to stay at four-under for the championship. Meanwhile, Gaganjeet Bhullar is all set to win the Royal Challenge Western India Amateur title as he goes into the final round with a comfortable lead of seven strokes over second-placed A S Lehal. Bhullar recorded a three-over 73 round today for his three-day tally of six-under 204. A S Lehal carded a level par 70 for his total tally of one-over 211. One stroke behind Lehal, in third position on the top of the table, was H S Kang, who fired a three-over 73. In judo, PAP Zone performed aggressively to clinch the team championship title with 27 points while Jalandhar Zone remained a close runners-up with 15 points. Patiala Zone and Ferozepore Zone shared the third place with 7 points each to their credit. Continuing with their winning spree, boxers of PAP Zone lifted the team title with 27 points while Ferozepore Zone remained second with 14 points and Jalandhar Zone finished third with 6 points. Harinder Kumar of Ferozepore Zone was declared best boxer while Baljinder Singh of Jalandhar Zone bagged the best loser award. PAP Zone also dominated the proceedings in athletics event. They won five gold medals out of 10 events. In 5000 m run (men), Managat Ram of PAP Zone won the gold while Parveen Kumar of PAP Zone secured silver and Davinder Singh of Patiala Zone bagged bronze medal. Jarnail Singh of PAP Zone won gold for his team in 200 m run (men), followed by Baljit Singh of PAP Zone (silver) and Gurdeep Singh of Jalandhar Zone (bronze). In 200 m run (women), Patiala Zone’s Kanwaljit Kaur bagged the gold medal while Rajwinder Kaur of Ferozepore Zone closely followed the former to win silver. Sarabjit Kaur of Ferozepore Zone bagged bronze medal. In high jump (women), Jalandhar Zone’s Kulwinder Kaur and Sukhchain Kaur won first and second position, respectively, followed by Sukhdeep Kaur of Patiala Zone. PAP Zone’s Diljot Singh and Iqbal Singh secured gold and silver medal, respectively, in 110 m hurdles (men), while Harbhajan Singh of Jalandhar Zone was placed third. Results: discus throw (women): Swaranjit Kaur (Jalandhar Zone) - first, Surinderjit Kaur (Patiala Zone) second, Suman Kumari (Ferozepore Zone) third; hammer throw (men): Harpal Singh (Jalandhar Zone) first, Gurinderjit Singh (PAP Zone) second, Baljeet Singh (PAP Zone) third; pole vault (men): Kulwinder Singh (PAP Zone) first, Naginder Singh ( Ferozepur Zone) second, Surinder Singh (Combined Zone) third; 800 m run (men): Kashmir Singh (PAP Zone) first, Saranjit Singh (PAP Zone) second, Daljit Singh (Patiala Zone) third; shot put (men): Gurdev Singh (Ferozepur Zone) first, Amarjit Singh (PAP Zone) second, Amandeep Singh (PAP Zone) third. Aresson Club defeated Sar Parivar Club by five wickets to enter the quarter-final of the ninth Sahibzada Ajit Singh Memorial Cricket Tournament at the Guru Gobind Singh College ground here today. Scores: Sar Parivar Club: 144 in 32.4 overs (Digvijay Prashad 28, Manish Kangra 22, Maninder Singh 20, Neeraj Tiwari 4 for 18, Sonu Vaid 2 for 23). Aresson Club: 148 for 5 in 32.5 overs (Amar Singh 64, Sonu Vaid 23, Anshul Lamba 2 for 15). Guru Gobind Singh College principal Dr Jaspal Singh inaugurated the tournament.